My ankle hurt A LOT immediately! I had gone up to block the spike and came down on the foot of the spiker (who followed through under the net!). The ankle quickly swelled and the throbbing pain prevented me from sleeping at all that night. I had severely sprained the lateral ligament complex while playing my favorite sport, volleyball. I quickly began a series of Prolotherapy treatments on my own ankle. It went like this (initially). I sprained my ankle on Thursday night. On Friday morning I treated the ankle with Prolotherapy. By the following Thursday it felt good and the swelling was down, I played volleyball Thursday night which led to swelling and pain again (you think?). I repeated this scenario for about six treatments before pausing to consider why I wasn’t getting better, like my patients did with Prolotherapy! It didn’t take much reflection to realize I wasn’t “avoiding strenuous exertion of the treated body area,” which is my standard advice to the Prolotherapy patients I treat (along with “Be active, as long as it feels good.”). I love volleyball and it was difficult, but I gave up my Thursday evening recreation while treating myself weekly (I was in a hurry) with Prolotherapy. After six treatments and two and a half months I returned to my beloved volleyball without pain or swelling! It has been 15 years since my ankle was restored by Prolotherapy. Since then I have done any recreational activity without pain or swelling of my ankle! Currently, I hike, water and snow ski, snow shoe, and cross country ski without pain or swelling! The ankle is a small but important joint. Injuries to the ankle are the most common orthopedic injuries in sports, especially volleyball, basketball, football, and jogging. So we see many patients with ankle pain/sprain. In this article, we will look at the treatment of ankle and foot injury with Prolotherapy. Prolotherapy treatment of the ankle and foot is very successful. It takes an average of four to six treatments, spaced two to six weeks apart, to achieve full healing. Arthritis: There are two primary joints at the ankle: the ankle joint proper, and the sub-talar joint. I almost always treat them both when either one is involved. Ankle arthritis can be set up by repeated severe sprains and the ensuing instability. Osteoarthritis is another common cause of ankle arthritis. 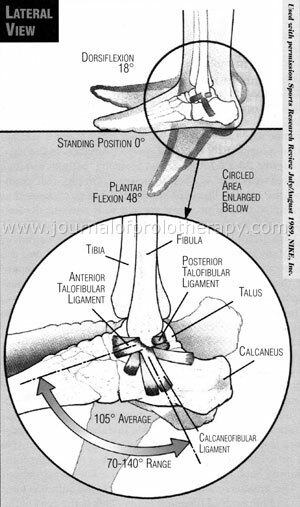 Identify the ankle joint by feeling anteriorly while flexing and extending the foot at the ankle. Feel for the dorsalis pedis artery so the injection can be given lateral or medial to it (and the accompanying anterior tibial nerve). Cleanse the skin, extend the ankle to open up the joint, then insert a 25G, 1.5-inch needle. Inject 3-4cc of 25% dextrose directly into the joint. (See Figure 1.) After withdrawing the needle, repeatedly flex and extend the joint to distribute the proliferant throughout the ankle joint. HGH may be added to the Prolotherapy solution if the joint is severely degenerated. Figure 3. Joint motion and stability. 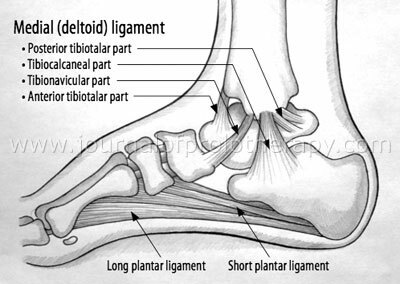 Injury to the above ligaments leads to chronic ankle instability and its associated symptoms. These include ankle pain, weakness, and frequent sprains. Used with permission of Beulah Land Press © 2001 Oak Park, IL. Prolo Your Sports Injuries Away!, fig. 23-11. Figure 8. 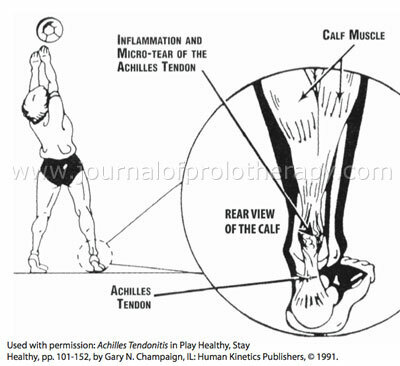 Achilles Tendon Injury. Prolotherapy is an excellent treatment to strengthen the Achilles tendon. Used with permission of Beulah Land Press © 2001 Oak Park, IL. Prolo Your Sports Injuries Away!, fig. 23-19. Plantar fasciitis: plantar fasciitis and heel pain are vexing problems that are frustrating and debilitating to patients. Fortunately they have come to us for treatment with Prolotherapy! 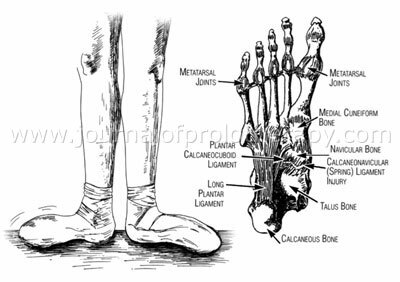 There are three primary areas for the injury to the plantar fasciitis: the calcaneous, mid-arch, and attachments to the metatarsal heads. The patient can accurately point to the offending spot, and palpation confirms the diagnosis. Figure 12. Abnormal foot biomechanics in a ballet dancer. Dancers develop a “dropped” arch to compensate for tightness in the hip, so successful treatment of the foot includes Prolotherapy to the plantar fasciia and spring ligament, as well as physiotherapy to the hip. Spring ligament injury is a common cause of a “dropped arch,” especially in ballet dancers. Used with permission of Beulah Land Press © 2001 Oak Park, IL. Prolo Your Sports Injuries Away!, fig. 30-19.